Last Saturday local Egyptians resident in Winnipeg and their supporters came out to demonstrate in solidarity with the people of the Egyptian revolution. It was an interesting, spirited and actually quite enjoyable demonstration. Mass media outlets estimated the crowd as anywhere from 130 to 200 people. Molly's own admittedly flawed count was about 150 to 160. It consisted of a wide variety of people, both in terms of ethnicity and in terms of age with people from school children to grandparents represented. Even the speeches were less annoying than they usually are at demonstrations...brief and to the point with representation from both Egyptians and the labour community giving their piece. It was actually amazing to me to see that there is indeed an Egyptian community here on the frigid prairies. One wonders how they ended up here, and there's surely a lot of wonderful life stories behind this fact. You can access video of the demonstration here , and there is a collection of photos here. For those interested in further information about the demo, and to see what might be upcoming in the future go to Winnipeg Protest For Egypt and Winnipeg Human Rights And Activist Events. In the interim here is how the demo was seen by the Winnipeg Free Press. Canada needs to be a stronger voice for democracy in Egypt to stop government-sponsored bloodshed in that country, said people at a Winnipeg rally Saturday. "Canada has said what the United States said, (that) we need a peaceful transition," said Basil Elmayergi in an interview after he addressed the rally supporting democracy in Egypt. But that implies allowing President Hosni Mubarak to stay in power until elections are held in September. That will result in a "slaughter-fest" by Mubarak's police and military against those advocating democracy, he said. "I don't think Canada is doing enough," said Elmayergi. About 200 people attended the rally on the legislative building steps. People waved Egyptian flags and placards and spoke passionately about the changes sweeping Arab countries in the Middle East and Africa. One placard said, "Game Over," beside a photo of Mubarak and another said, "We Are Finally Free." Elmayergi heralded those in Egypt who have stood up for democracy as "our courageous brothers and sisters." "Send a message that there has been enough beatings, enough torture, enough oppression," he said. "(Egypt) is going to be such a great country — a leader in the Arab world, a leader to the African continent." Winnipeg's Egyptian population is estimated at only about 200 people, but the city has about 6,000 people of Arabic descent. Saturday's crowd was a mix of both. Arabic people in the crowd said they see what is happening in Egypt, after the ouster of the dictatorship in Tunisia late last year, as the beginning of change throughout the Arab world. "I think Tunisia was an inspiration for all of us," said Shirin Farag, Elmayergi's wife, who came to Canada 17 years ago. "When Egypt saw that a nation of 10 million people (Tunisia) was able to oust its president, Egypt, with 80 million people, thought it could do it, too," she said. Kadim Al-Roubaie, who emigrated from Iraq 36 years ago, said he attended the rally "to support democracy." "I've lived here 36 years. I love it. It's a privilege to live in a democracy," he said. Here is the much more brief notice published in the Winnipeg Sun. It should be noted that their estimate of about 130 is low. Personally I am not given to inflating crowd numbers as I believe it is bad policy in the long term. My own count of 150 to 160 may be slightly on the low side and is definitely not an overestimate. 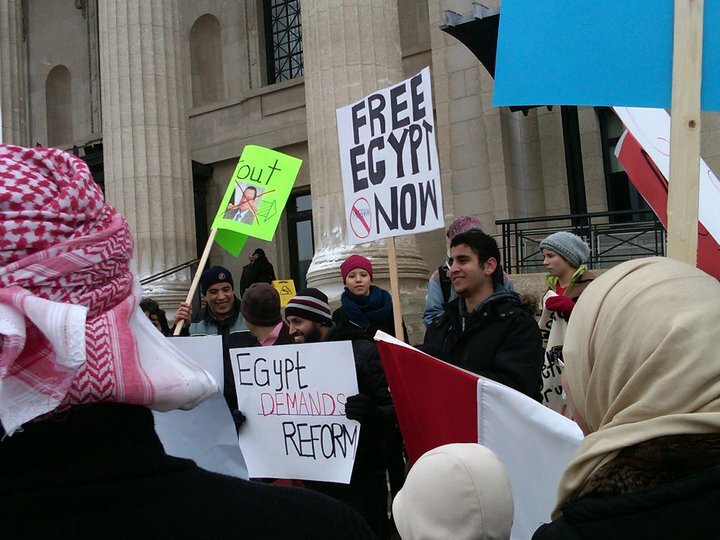 A crowd of Winnipeg protesters on Saturday joined the spirit of fierce demonstrations a half a world away, demanding that the Canadian government pressure Egyptian President Hosni Mubarak to resign. About 130 people converged at the Manitoba legislature's front steps to shout their anger at what they say is the Harper government's unwillingness to push Mubarak to step down immediately, in the face of outrage in Egypt over government policies that protesters there say are hurting their country. Unlike the violence that has marked the massive rioting and street battles in Cairo for the past week, though, the Winnipeg demonstration was emotional yet peaceful. Despite talk in recent days of a possible "transition" of power from Mubarak to a successor, Egypt's longtime president has remained in office.